Your June 4th article, “Evo Morales Demands the OAS Stop Serving the Empire,” succinctly highlights the Bolivian President’s ill-placed domestic priorities. You rightfully condemn the misuse of the Organization of American States (OAS), as a regional forum, which Morales has used as a soapbox to laud his country’s feats in the past six years. In so doing, you refer to political analysts Ximena Costa and Fernando Untoja, asserting that more pressing “concrete” issues—those that affect multiple nations—must take precedence over domestic ones. However, despite your suggestive title, you minimally address Morales’ serious attempts to curb the American empire’s regional reach. Throughout the current proceedings, he has called for the weakening and potential elimination of the Inter-American Human Rights Commission (IACHR) as well as re-founding the OAS itself, with the hopes of shifting the power dynamics of the existing organization. It is foolish to neglect the imminent threat that such actions pose, notably to the enforcement and protection of human rights in the region and the overall livelihoods of the underrepresented. Morales’ enmity towards the IACHR has long been echoed by other left-leaning states, primarily Venezuela and Ecuador—two nations that in the past have outspokenly called for reform or, if necessary, its dissolution. In order to halt what Morales and Ecuadorian President Rafael Correa identify as “American mechanisms of control,” they argue that a restructuring that limits the IACHR jurisdiction must occur. 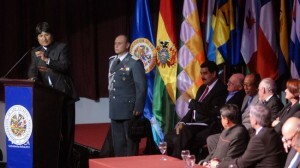 Though you fittingly identify demands for the disbanding of U.S. military bases throughout the continent as a means to weaken imperial servitude, you woefully ignore the controversy surrounding the reformation of the IACHR, headed by Venezuela, Ecuador and Bolivia. This polemical move represents one of the tools needed to delineate potential plans for a new, more region-specific organization, one excluding the United States. While these may currently be faint claims, the elimination of the IACHR would pose a real threat in the legitimacy of the OAS, albeit one advanced by a limited number of nations. If the IACHR is in fact reined in under the auspices of self-interested nations, human rights violations will face one fewer barrier and even possibly render the OAS pointless. It is therefore imperative to reiterate the importance of not only strengthening the IACHR, but also reaffirming its autonomy.